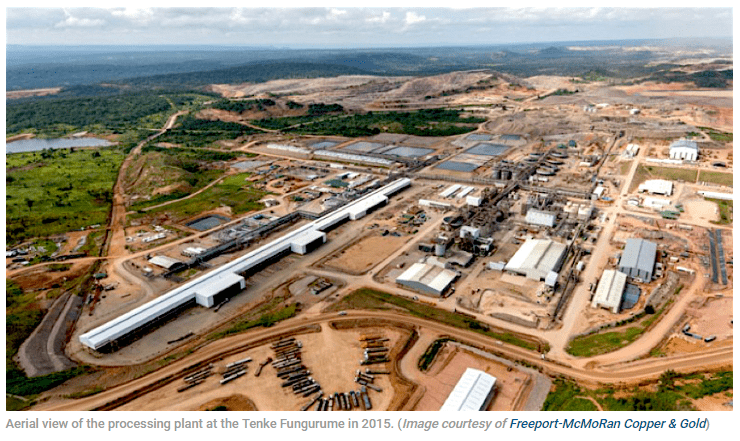 China Molybdenum, which bought the giant Tenke Fungurume copper and cobalt mine from Freeport-McMoRan in 2016, is buying a holding company for $1.14 billion that will give it an 80%-stake in Democratic Republic of Congo’s operation. The Chinese miner, which has spent almost $5 billion in the past two years on an acquisition rampage, said it had agreed to buy BHR Newwood DRC Holdings Ltd, a holding company set up by private equity firm BHR to buy a 24% stake in Tenke in 2017. The company already has a controlling stake in the mine, after acquiring a 56% interest in 2016 that was held by Freeport, in a $2.65 billion-deal. 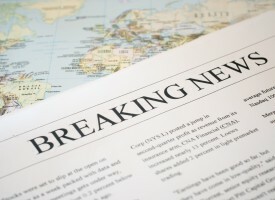 Congo’s state miner Gecamines has a 20% interest in the operation. Congo, which vast deposits of cobalt and copper, as well as gold, diamonds, tin and coltan, is one of the world’s most important but difficult mining jurisdictions. Gold miners need to do something to spark some interest in their stocks. Sometimes, though, one’s choices are influenced by the choices of others. In this case, Goldberg can’t have failed to notice strong hints from the market. 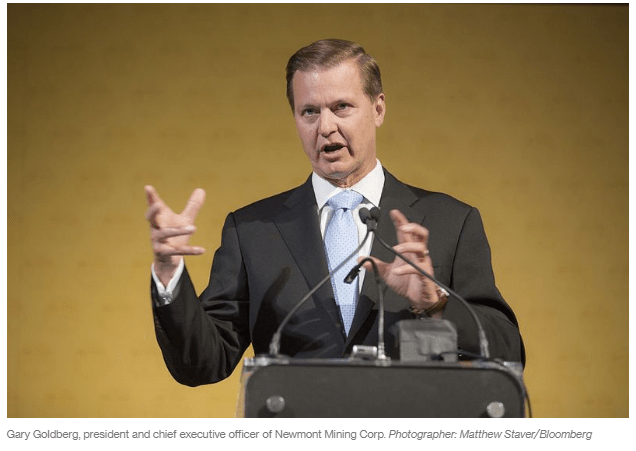 This round of consolidation — Newmont’s move follows a Randgold Resources Ltd. deal with Barrick Gold Corp. announced in September — puts me in mind of the mega-mergers in the oil industry 20 years ago. Back then, there was a flurry of deals to create supermajors like Exxon Mobil Corp. With oil prices having collapsed in 1998, the industry saw self-help in the form of cost-cutting and high-grading of portfolios as the path to redemption — and it was (aided by an enormous rally in oil, of course). 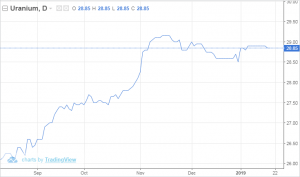 (Reuters) – Global miner Rio Tinto on Friday logged a slight drop in quarterly iron ore production in December and said it expected to produce more iron ore in 2019 in a target range that was at the lower end of analyst expectations. Goldman Sachs Group Inc. is leading a pack of bullish voices cheering for gold. The bank’s analysts led by Jeffrey Currie raised their price forecast for gold, predicting that over 12 months the metal will climb to $1,425 an ounce — a level not seen in more than five years. 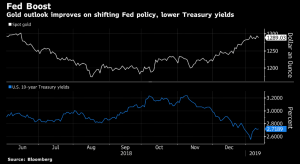 Bullion has benefited as rising geopolitical tensions fuel central bank purchases, while fears of a recession helped boost demand from investors seeking “defensive assets,” they said. PERTH (miningweekly.com) – The Minerals Council of Australia (MCA) has warned that jobs and investments in the resources sector were under threat from the Northern Territory government’s proposed Environment Protection Bill and Regulations. The draft legislation addresses the environmental impact assessment and approval framework; a separate legislative process will address the reforms to waste, pollution, land clearing and the environmental impacts of mining. However, the MCA said this week that the new mining taxes proposed by the Environment Protection Bill and Regulations would threaten high-paying jobs, living standards and investment in the Northern Territory. In its submission to the government, the MCA outlined a series of so-called cost recovery measures and non-refundable financial assurance levies which it said would unfairly tax miners and undermine the future of communities across the Territory. The six semi-finalists for #DisruptMining 2019 and the five ‘sharks’ who will judge the live finale of Goldcorp’s yearly innovation challenge have been named. Commercial Pau: With the use of a patented biometric technology, this company’s Digital Remote Lock Out System is designed to enhance safety and security on-site while reducing the amount of time required to effectively complete the lockout process. Envisioning Labs has developed an innovative concept to reuse mine tailings to produce concentrated solar power reflectors. These reflectors are then used to generate clean energy and sorbents to reduce pollution. ETF Mining’s Modular Mining Vehicles are fully electrified, digital and autonomous, offering improved efficiency and reduced environmental impact. Their modularity allows for the adoption and integration of new technologies as they become available. Gekko Systems supplies innovative modular equipment and processing technologies focused on the recovery of gold. It is introducing the development of a product, the OnLine Gold Analyser, which will help determine the actual gold content in mineral processing slurries and solutions in real time. Hydrostor’s Advanced Compressed Air Energy Storage technology transforms unused mining infrastructure into energy storage systems that help mines manage their energy use and reduce their environmental footprint. The system can serve both the electricity grid and mining operations alike, reducing operational costs and providing legacy mines with new revenue opportunities. RubberJet Valley uses a proprietary high-pressure water jet that breaks down large truck and mining ‘OTR’ (off-the-road) tyres in an environment-friendly way. The resulting material is then used to produce new tires or other rubber-based products for commercial use. Three finalist will be named next month and will pitch their ideas to a panel of industry leaders, who will award one of the finalists the opportunity to negotiate a $1-million investment in its technology, company or idea. New underground mining precision performance software, using machine learning to refine and enhance loading and haulage processes, is set to be launched by global mining software company, Micromine. The solution is to be released in early 2019 as part of the company’s fleet management and mine control solution, Pitram. Using the processes of computer vision and deep machine learning, on-board cameras are placed on loaders to track variables such as loading time, hauling time, dumping time and travelling empty time. The video feed is processed on the Pitram vehicle computer edge device. The extracted information is then transferred to Pitram servers for processing and analyses. Micromine Chief Technology Officer, Ivan Zelina, said the solution considered the information gathered to pinpoint areas of potential improvement that could bolster machinery efficiency and safety. “Pitram’s new offering takes loading and haulage automation in underground mines to a new level,” Zelina said. 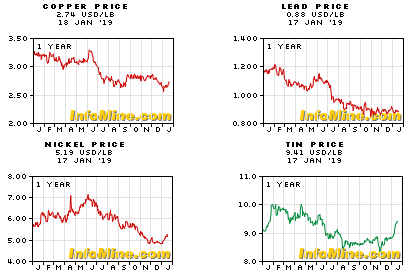 A year ago, the company said it needed about £5 million to develop its project, which aims at extracting lithium from hot water brines below the surface that have welled up in the county’s historic tin and copper mines. 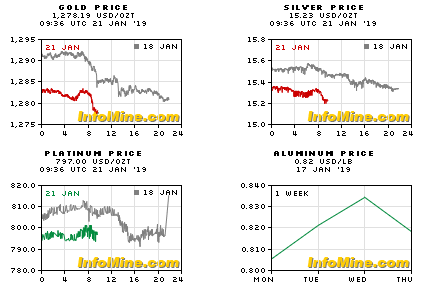 The company will also begin exploring for lithium in hard rock form for the first time, having discovered evidence that it was mined in the area during World War II. 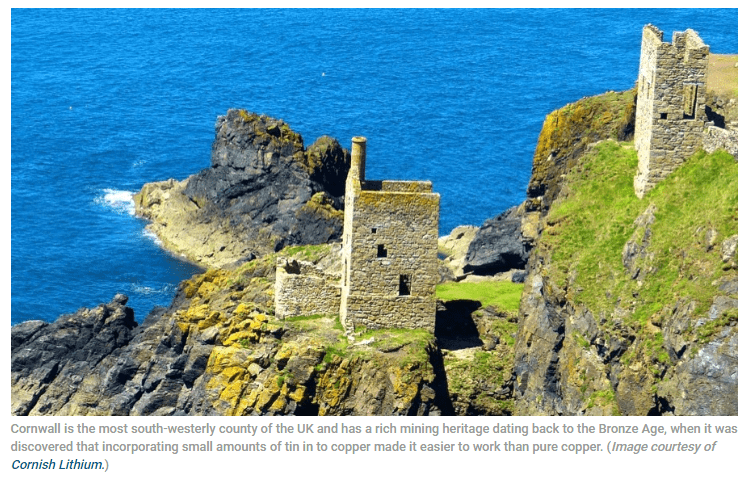 Cornish Lithium, which closed its latest funding round last month, has decided to also begin exploring for lithium in hard rock form for the first time, having discovered evidence that it was mined on the surface during World War II. Over the past year, the company has expanded and consolidated the areas over which it has rights to explore for lithium and other minerals. The company says its team has assembled a vast amount of historical data and reconstructed this in 3D digital format, enabling a totally new understanding of the geological potential of Cornwall’s mineral deposits.